PHOENIX, AZ-The Arizona Cardinals football team will begin the 2006 football season as residents of the city's newest high-tech sporting venue. The 63,000-seat Cardinals Stadium in Glendale, AZ, was designed by award-winning architect Peter Eisenman in collaboration with HOK Sport and Hunt Construction Group. The stadium is designed with a retractable roof and North America's first retractable playing surface, a massive 400- x 235-foot, 17-million-pound platform that is designed to roll along rails to the exterior of the building to expose the grass to daylight. The concrete floor beneath the moveable field is designed with a power and data utility grid to accommodate trade shows, concerts, motor sporting events and a variety of other functions while the playing surface remains outside, undamaged.The stadium also boasts what is one of the first distributed line-array sound systems, employing a ring of 10 separate arrays of self-powered Meyer Sound MILO high-power curvilinear array loudspeakers. Each array holds seven cabinets, with an array located on either side of each of the 30-yard lines, one on either side of each of the goal posts, and one in each end zone. An additional ring of 28 loudspeaker clusters, each using three Meyer Sound UPA-1P compact wide-coverage loudspeakers, delivers sound to the uppermost balcony seating, which is above the coverage of the arrays. 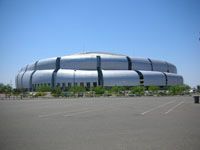 The 63,000-seat Cardinals Stadium in Glendale, AZ, which has been likened to everything from a coiled rattlesnake to an alien spacecraft, boasts one of the first distributed line-array sound systems, employing a ring of 10 separate arrays of self-powered Meyer Sound MILO high-power curvilinear array loudspeakers. Pro Sound, a Miami, FL-based systems integrator, worked with Pelton Marsh Kinsella (PMK) Consultants of Dallas to design and install the system. As Shoemaker explained, "The digital output from the Yamaha DM2000 console is routed to a Biamp AudiaFLEX DSP unit then, via an HP Procurve Ethernet switch, through fiber-optic cabling to series of AudiaFLEX units, one in each of four AV rooms. The Audias in the AV rooms convert the signals to analog and send them directly to the MILO arrays." The multimode fiber also carries signal for the Meyer Sound RMS remote monitoring system, which provides real-time monitoring and control of each individual loudspeaker cabinet. "The height of the arena created a few logistical challenges," Pro Sound's Rod Sintow recounted. "A standard man lift might typically make it to about 135 feet, whereas the MILO arrays were hoisted to close to 200 feet in the air." A special lift capable of reaching to 236 feet was brought in for the job, but proved to be less than dependable. "We brought each of the arrays up to the top of the Brunel truss, hung the motor from the truss and then pulled the arrays into position," Sintow explained. As Sintow observed, the MILO arrays were the right choice for a challenging job. "We chose the MILOs primarily for their performance, but they really saved us a lot of time and money," he remarked. "Even with the lift's frequent breakdowns, we hung the entire MILO setup in only nine days, with a crew of six guys. In addition to Shure UHF-R series wireless systems, the control room's Middle Atlantic Products racks house a pair of Symetrix model 302 dual mic preamps, as well as a 360 Systems Instant Replay, Roland AR-200 and AR-3000 Message Repeaters, and CD, tape and playback units from Tascam and Marantz.